Catholic Charities held its biennial Dragon Boat Races at Baltimore’s Inner Harbor Sept. 6, drawing more than 8,000 team members, volunteers and spectators. The fundraiser brought in more than $700,000 for the Maryland charity, said William J. McCarthy, its executive director and CEO. It also forged bonds between some of Baltimore’s leading businesses and organizations and Catholic Charities programs – bonds Catholic Charities hopes continue long after race day. 1) T. Rowe Price won. So did Hamel Builders and DAP Products, in the races’ A, B and C divisions, respectively. 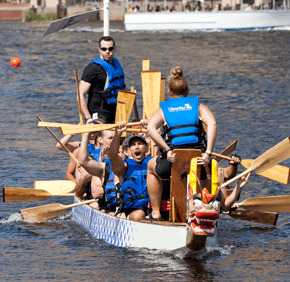 T. Rowe Price went into race day as a defending champion, and reclaimed a first-place trophy for the fourth time since Catholic Charities began the Dragon Boat Races in 1998. All three division winners went undefeated throughout the day in the double-elimination race. T. Rowe had the day’s fastest time, at 1 minute, 37.97 seconds, in its penultimate race. Each boat carries 20 paddlers; a steerer, who manipulates a long paddle at the stern; and a drummer, who sets pace with a drum in the bow. The boats raced on a 1,290-foot course between the World Trade Center and Maryland Science Center. 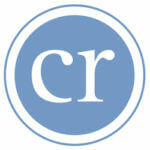 2) The action was in the water, but the focus was Catholic Charities. Throughout the day, the 32 teams were introduced with their partner program, and allusions to Catholic Charities’ programs appeared in auxiliary competitions throughout the day. Prior to race day, teams were encouraged to spend time with their program’s clients. Members of some pairs, such as Harkins Builders and Villa Maria in Timonium, have developed a strong, continuous relationship. Many Catholic Charities clients were among the spectators that lined the water’s edge. “As a community, coming together for one day like this, raising the dollars that we raise, knowing that it’s going to have a profound impact on hundreds of thousands of lives – that’s pretty awesome,” McCarthy said. Vicki Burroughs brought her 3-year-old daughter, Kapri Harris, who attends St. Jerome’s Head Start, and 6-year-old son, Jerry Harris III, to support the program and its partner, Wells Fargo. She appreciates St. Jerome because “if we need anything, they’re right there to help us,” she said. See a photo you would like to purchase? Click here. 3) Catholic parishes and schools represented. Among the 32 teams were two Catholic schools: Monsignor Slade in Glen Burnie and St. John the Evangelist in Severna Park; three organizations: Catholic Charities, Catholic Relief Services and the Archdiocese of Baltimore; five Baltimore City parishes: St. Vincent, St. Alphonsus, the Basilica of the National Shrine of the Assumption of the Blessed Virgin Mary, Corpus Christi and St. Ignatius of Loyola, who raced as one team; and one university, Notre Dame of Maryland University, which paired with the U.S. Air Force for its team. The downtown parish cluster was the first parish-based team to participate in race history, Catholic Charities confirmed in July. McCarthy believes that this year’s races saw the most Catholic-based entrants in race history. St. John the Evangelist – which raced for DePaul House, a senior living community – first participated in 2012. Father James Proffitt, pastor of St. John the Evangelist parish, said the races gave the school a chance to practice what it preaches. “It’s one way that we take all the words that we’re preaching to the kids … and show them real concrete ways to do it,” he said. Casey Buckstaff, Monsignor Slade principal, agreed. Her team partnered with Friendship Station senior housing in Odenton. Buckstaff was assistant principal of St. John the Evangelist in 2012 and led its dragon boat team. She wasn’t surprised to see them return to the competition, she said. “Once you’ve done it, you just don’t want to miss it,” she said. 4) Successful teams master timing and teamwork. Ada Ma was among the dragon boat coaches who watched the amateurs from the stands. The Catholic Charities event introduced her to dragon boat racing in 2002. She also competed in the following three races and joined the Baltimore Dragon Boat Club. She met with teams nearly every week of July and August and coached them on timing and teamwork. Lest the steady steam of races look easy to spectators, race No. 38 reminded them it wasn’t. KPNG collided with SunTrust, swamping their boat – a first in the races’ history, McCarthy said. A Baltimore City rescue boat rescued the paddlers. In the Division C finals, Wells Fargo paddlers went off course, adding a half-minute onto their time. 5) The races weren’t the only competition underway. When teams aren’t racing, they spend time in Tent City, often with people connected to their Catholic Charities partner program. The tents are decorated – and judged. Also judged are team-designed drummer hats (which the drummers don’t actually wear when racing) and team chants, adding to the event’s festivity. “In Baltimore, we love these kinds of quirky events that pit organization against organization,” said Baltimore City Mayor Stephanie Rawlings Blake, whose office competed for My Sister’s Place Lodge.